Roller derby was a sports entertainment phenomenon in the 1950s, gained a new generation of fans via television in the 1970s, and underwent a twenty-first century resurgence with a feminist impulse. 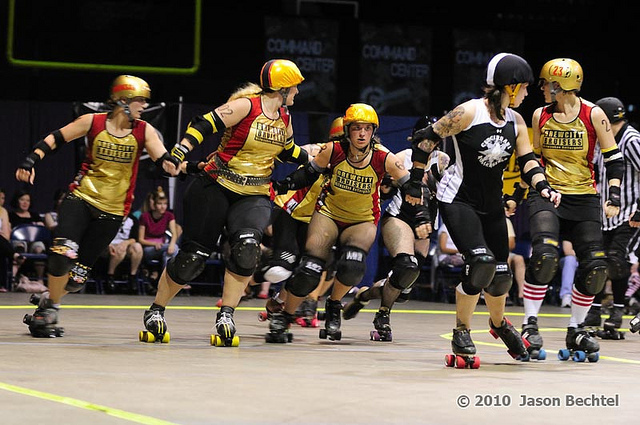 As part of this third wave of organized roller derby, the BrewCity Bruisers began holding “bouts” in 2006 at the Milwaukee County Sports Complex. The league’s mission is “to deliver a quality women’s sport to Milwaukee and the greater derby community.” The Bruisers, a four-team skater-owned and operated league, began competing at the U.S. Cellular Arena in 2010 and are members of the Women’s Flat Track Derby Association. Milwaukee’s men’s team, the Milwaukee Blitzdkrieg, was founded in April 2009 and competes in the Men’s Roller Derby Association. ^ “Mission,” Brew City Bruisers: Milwaukee Rollergirls, last accessed July 11, 2016. ^ “League History,” Brew City Bruisers: Milwaukee Rollergirls; Bill Glauber, “Belles of the Brawl.” Milwaukee Journal Sentinel, January 15, 2010. ^ “MRDA Goes International with Its Six New Members,” Men’s Roller Derby Association, last accessed July 11, 2016. Callard, Abby. “Glitter vs. Grit.” Milwaukee Magazine, May 2013. Cohen, Alex. Down and Derby: The Insider’s Guide to Roller Derby. Berkeley, CA: Soft Skull Press, 2010. Garber, Elizabeth, and Erin Garber-Pearson, “Tramps and Bruises: Images of Roller Derby and Contemporary Feminism,” in Girls, Cultural Productions, and Resistance, Michelle S. Bae and Olga Ivashkevich, eds. New York: Peter Lang Publishing, Inc., 2012. Mabe, Catherine. The History and All-Girl Revival of the Greatest Sport on Wheels. Golden, CO: Speck Press, 2008.